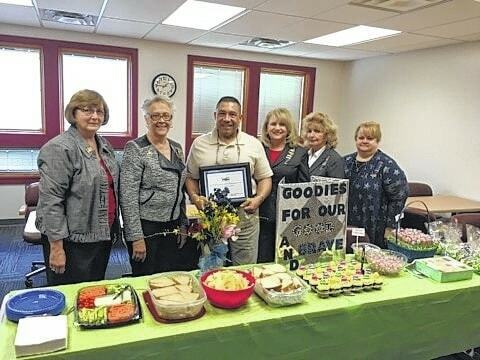 The Scioto Valley Volunteers (SVV) Chapter, United States Daughters of the War of 1812 Society, recognized the men and women of the Ohio State Highway Patrol (OSHP) Portsmouth Post as the first recipient of their “Goodies for our Good and Brave” campaign. The ladies of the SVV expressed their appreciation for the vital community service provided by the staff of the Post by treating them to a table of “goodies”. Lieutenant Mike Gore was on hand to accept a “Certificate of Honor and Appreciation” presented to the Post by Gail Swick, Chapter President, and Beth Normand, Chapter VP/Public Relations Committee Chairman, on behalf of the SVV Chapter. The “Goodies for our Good and Brave” campaign has been initiated by the Scioto Valley Volunteers Chapter for the purpose of honoring Scioto County’s own national defenders in the area of law enforcement/first responders service organizations. The next planned event is expected later this year. Please visit the Ohio Society U.S.D. 1812 website at www.ohiodaughters.org/ohio1812 for information regarding membership, or email Joan Phillips at mphillips19@roadrunner.com.